One of the most thrilling moments in the physical yoga practice is that first moment of lift off during an arm balance. Arm balancing poses look advanced and sometimes intimidating from the outside. But when you leave your ego off the mat and approach arm balances with humility, they can become a magical and playful experience. There are so many benefits to including arm balances in your practice. The obvious benefit is that arm balances look incredibly cool! Arm balances look fun and challenging because they are fun and challenging. Attempting arm balances requires humility and the willingness to fall. With this comes a mindset shift from serious yoga practice, to the openness to play. As such, arm balances will infuse your yoga practice, and your own spirit, with a sense of joy and lightness. There are more tangible benefits to practicing arm balances, as well. For one, arm balances will help with strengthening. The obvious muscle groups that are affected are the arms and wrists, but arm balances also help strengthen the shoulders, back, and core. Additionally, arm balances can help with detoxification, digestion, headache reduction, fatigue reduction, mood regulation, and more. There is a huge variety of arm balancing poses, and each one will carry its own unique benefits, in addition to those benefits derived from being an arm balance. For instance, twisting arms balances also carry the benefits of twisting postures, namely “wringing” out the organs, spurring digestion, detoxifying the liver, and more. 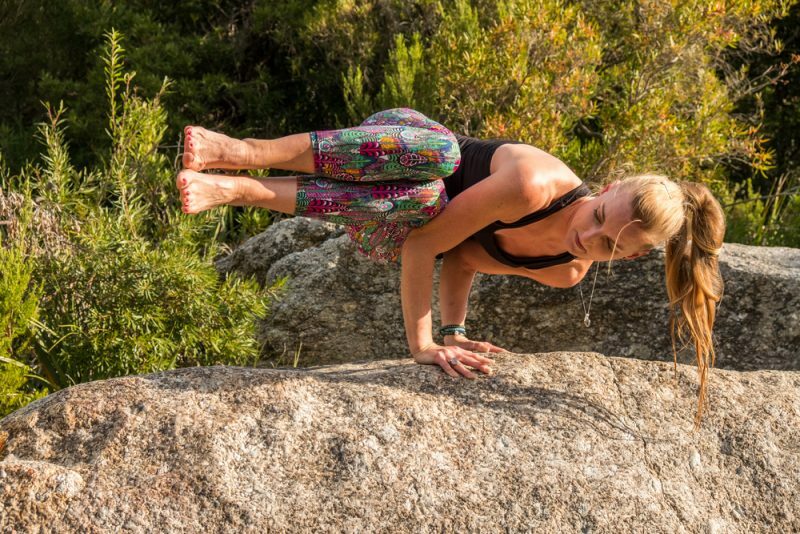 The Secrets Of Arm Balances: Take Flight! Most people, when attempting their first arm balances, feel like a pile of lead. It can be incredibly frustrating to see other yogis in the class lift off in what looks like magic, whilst you are firmly stuck on your mat. At this point, many yogis may write this off as lack of strength. Surely, if you can’t lift up into an arm balance, you need to build stronger arms, right? While this may make sense at first, it is actually more complicated. The yogis who easily lift off into arm balances may not necessarily be stronger than you: They may just know the secrets of arm balances. Indeed, there are two major “secrets” to lift off. Once you master these two areas, you will find arm balances much more achievable. Mula Bandha: Located in the perineum, Mula Bandha is the first bandha. It is easiest to explain as the muscles you contract when you are holding your bladder. Mula Bandha is the root lock, and traditionally should be engaged for the entirety of practice. Uddiyana Bandha: Located in the diaphragm and abdominals, Uddiyana Bandha is the second bandha. It is known as the flying up lock. It is engaged by sucking in the frontal abdominal wall and engaging your diaphragm and abdominal muscles in and up. It offers a sense of lightness and lift. Jaladhara Bandha: Located in the throat, Jaladhara Bandha is the third bandha. It roughly translates to “net and stream lock,” referring to a net that captures the upward flowing energy from both the previous bandhas. Each of these three bandhas can help with lifting during arm balances. Instead of letting your energy and weight sink into the mat, engaging mula bandha, uddiyana bandha, and even jaladhara bandha can help you lift off. The second major secret to arm balances is simple physics: Counterbalancing! If you want to lift your shoulders and head in a posture, then you need an equal and opposite weight to balance it. This usually means your legs! Many people stay stuck on the ground because they only focus on lifting one end of their body. To lift up into an arm balance, you need to lift both ends of the body. In some poses, this may mean leaning far forward. For example, in crow pose, you need to lean your shoulders and face far forward in order to lift off your bottom knees, and feet into the air. Many people avoid this out of fear of hitting their face on their mat. Have faith in your body, and physics, that will keep you afloat! And if all else fails, place a pillow beneath your face as you get used to the feeling of counterbalance. The following is a short yoga sequence that focuses on arm balances, and specifically twisting arm balances that will help with detoxification. Spend your time exploring and playing in each pose. As you transition between each pose, take one vinyasa sequence. Before you delve into your arm balances, it is important to properly warm up the body. Begin your practice with the sun salutations (surya namaskaras). Ideally, practice five sun salutation A’s and five sun salutation B’s, which will build heat within the body and prepare every major muscle group for the arm balances ahead. Squat down on your mat, keeping your feet together and your thighs parallel to the floor. Plant your hands on the mat in front of you. The fingers should face forward, and your wrist crease be parallel with the front of the mat. Bend the elbows backward in a right angle, as if you were performing chatturanga. Pivot your feet and knees toward the right. Lean forward and plant your left hip above your left elbow, and your left knee above your right elbow. The right leg is stacked evenly on top of the left. From here, deepen the bend in the elbows and lean forward. Use counterbalance as you lean your shoulders and head forward to gently lift the feet off the mat. In full posture, you should be able to lift your left hip from your left elbow, and solely be balancing the legs on the right elbow. This is side crow pose. Eight angle pose is a challenging twisting arm balance that requires strength, mula bandha and uddiyana bandha engagement, and the courage for adequate counterbalancing. To practice eight angle pose, start by sitting on your mat with your legs extended straight out in front of you, in dandasana, or staff pose. Lift your right leg and bend the knee, keeping the sole of the foot facing forward. Open the hip, and using your hands to help you, place the right thigh around the back of the right shoulder. The knee should be sitting on the shoulder, with the calf and foot still coming forward. Plant both hands firmly on the mat. Straighten your arms, and lift the bottom off the mat. Engage your mula bandha and now lift your left leg off the mat as well, so you are floating. From here, bend your left knee and wrap the ankles around each other. Lean forward, bending the elbows straight back as if in chatturanga arms. As you lean forward, straight the legs out. This will help you create counterbalance between your shoulders, head, and feet, against the weight of your hips and bottom. Eventually your entire body will be lifted evenly. This is eight angle pose. This pose, called pose dedicated to the sage Koundinya I, has a lengthy name, and can look very complex to enter. However, once you have mastered side crow pose, it becomes much easier to enter. Start your transition from side crow on the right. The instructions for entering side crow pose are mentioned previously. Inhale in side crow, and exhale and straighten your left leg, which should be on the bottom pressing into your arm. Straighten that leg out to the side of the room. At the same time, straighten your right leg, which is on top. However, shift your right hip to neutral. Now, your right leg should be straightened all the way toward the back of the room. To maintain the lift, lean your face forward whilst reaching the right leg upward. This pose will give you a deep twist in your low belly and hip joints. Hold here for as long as you can comfortably, before releasing and attempting on the other side. This is the second pose in the Koundinya series. It is similar to its predecessor, pose dedicated to the sage Koundinya I, but instead of twisting the hips, they are neutral in this pose. To enter this pose, squat down on your mat and place your hands firmly on the mat in front of you. Bend the elbows straight toward the back of the room, as if in chatturanga posture. As you do so, lean the shoulders and torso forward. Bring the left inner thigh forwards and up, and plant it on the back of the left arm, above the left elbow. Straighten the leg out to the side of the room. Continue leaning forward, and when you feel ready, lift your right back leg straight to the back of the room. This will require not only the proper amount of forward counterbalance, but also deeply engaging the core muscles and psoas, as well as mula bandha and uddiyana bandha. Keep your lift here, and twist your head and gaze so you are looking at the toes of your extended left foot. Hold this pose for as long as is comfortable. Gently release, and try on your other side. The previous poses are the four most well-known arm balance poses that also involve twisting. Each pose is challenging, but having an understanding of how to properly enter them, as well as important tricks like counterbalancing and engaging the bandhas, can enable an easier arm balance practice. These four poses can be a fun and playful addition to any yoga practice. Or, you can practice all the poses in one sequence, just by adding a vinyasa between each pose. Finish up your practice with some restorative postures and savasana. Whether you decide to add arm balances to your yoga practice gradually, or dive in with this twisting arm balance yoga flow, you will love the benefits you find. Not only will your arm and shoulder strength dramatically improve, but you’ll notice a new sense of mental lightness and joy infuse your practice.